Zach Horvath is the founder of LIVE A GREAT STORY. His company is a lifestyle brand focused on inspiring people to be the hero of their story. Thousands of people have been inspired by Zach, and the coolest part is that he is actually living a great story in his own life. Zach has been on the entrepreneurial journey for over a decade. Starting his first business in high school he has never looked back. After returning from an extended travel experience in 2013, he launched in a strange way. Zach spray painted LIVE A GREAT STORY on a wall in Austin, TX and people started sharing it on social media. Five years later LIVE A GREAT STORY has grown to globally recognized lifestyle brand that spreads a ripple effect of inspiration. Imagine having a life where you spread inspiration, travel, and meet cool people. Zach hands out “live a great story” stickers, and leaves a path of joy with all those whose path he crosses. This is the story of Zach Horvath. Check out this conversation between Zach and Thom Singer and get ready to rock your 2019. 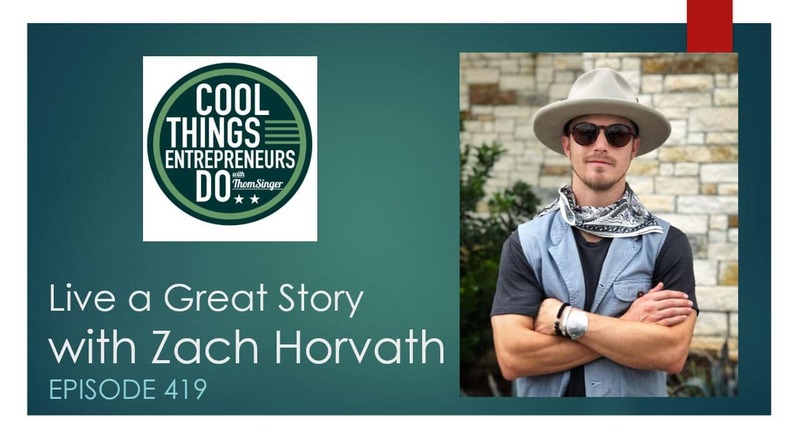 Thom has known Zach Horvath since early in this young entrepreneurs journey. “Live A Great Story” was just an idea when they met. However, over the years Zach has poured his soul into making LAGS more than a slogan. This is about more than words you would see on a T-Shirt (although you can buy the “Live A Great Story” tshirts and other cool products at the Live A Great Story website). When you listen to this episode of the Cool Things Entrepreneurs Do podcast your will get energized by all Zach has done in his young life. Join the journey and live a great story. Be sure to follow Zach on social media. The guy embodies LIVE A GREAT STORY. He travels the world and experiences life in a way that few people of any age have ever done. His Instagram (@CommonVandal) is always filled with pictures of jungles, beaches and mountain views. Thom Singer is a motivational speaker and professional master of ceremonies. He is also the host of the “Cool Things Entrepreneurs Do” podcast and the author of 12 books.